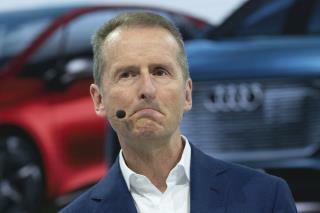 (Newser) – Volkswagen CEO Herbert Diess is in hot water for what he's now calling "definitely an unfortunate choice of words" he used at a company event Tuesday: "EBIT macht frei." If that sounds familiar, it's because it echoes "Arbeit Macht Frei," or "work sets you free"—the slogan on the gates of the Auschwitz concentration camp. In Diess' phrase, "EBIT" is an acronym used to mean "earnings before interest and taxes," and in his explanation, he said he was referring to EBIT's importance to the freedom VW brands have, France 24 reports. OMG. Now you're not allowed to say anything that rhymes with something said by the Nazis? Next they'll outlaw the term "twig pile" because it sounds like "Sieg Heil". SJWs love to point out that you cannot think for yourself. “Arbitren macht frei“ Workouts make you free! Do you even lift?